Over the past month the blog has exceeded 250,000 page views in total and is quickly approaching 300,000. Congrats on all of your milestones! Thanks so much for stopping by my blog and commenting! I'm now following! Huge congratulations Avril! You are doing a fab job:) I must save a bottle of bubbly for when you are around Naas next time!! Didn't she do well" do you remember dad used to quote from the rise and fall of Reginald Perrin " I didn't get to where I am today " etc... Well you didn't get to where u are today without lots of work and commitment to shopping walking in high heels since the age of one and a fashionable mum... An eye for a bargain and a great smile. So keep up the good work. Congrats Avril, champagne is well deserved, you've achieved so much in such a short while! I think the key to your success is that you are one of us and we can relate to you. Sláinte, here's to your continued success! Congratulations! 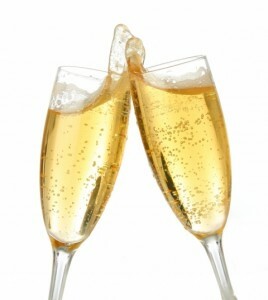 Enjoy the well deserved bubbles! Fantastic Avril- great to see it doing so well! SO well deserved Avril... I was really chuffed for you when I saw your follower numbers pass 200 while you were away! BLIMEY!!! You have done amazingly well but with all your hard work it's no wonder! Congratulations to you!! Congrats on your half birthday! Big mile stone =) Your blog is lovely! Yay! This is wonderful. :) In such a short time, too. I don't believe I had 220 followers until my second/near third year of posting. That's awesome!